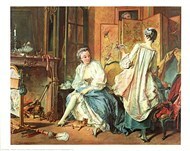 François Boucher (born September 1703) was a French decorative artist and painter in the Rococo style. He was probably the most celebrated decorative artist and painter of the 18th century. 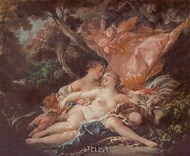 Boucher is known for his voluptuous and idyllic paintings on pastoral scenes, classical themes, and decorative allegories. He also painted several portraits of Madame de Pompadour, his patroness. Reflecting inspiration gained from such artists as Antoine Watteau and Peter Paul Rubens, his early works celebrate the tranquil and idyllic portrayal of landscape and nature with great élan. Boucher was the son of Nicolas Boucher a minor painter who gave him his first artistic training. 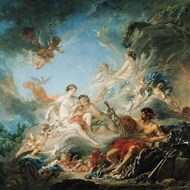 At seventeen years of age, his painting was admired by the painter François Lemoyne who later appointed him as his apprentice, but after only three months, Boucher went to work for an engraver called Jean- François Cars. Boucher’s art typically did not follow the traditional rural innocence to portray scenes with a definitive eroticism style. His mythological scenes were intimately amorous and passionate rather than traditionally epic. Boucher won the elite Grand Prix de Rome in 1720 for his painting, but due to financial problems he did not take up the opportunity to study in Italy until five years later. On his return from studying in Italy on 24 November 1731, Boucher was admitted to the re-founded Academie de peinture et de sculpture. He became a faculty member in 1734 and since then his career accelerated as he was promoted Professor then Rector of the Academy.